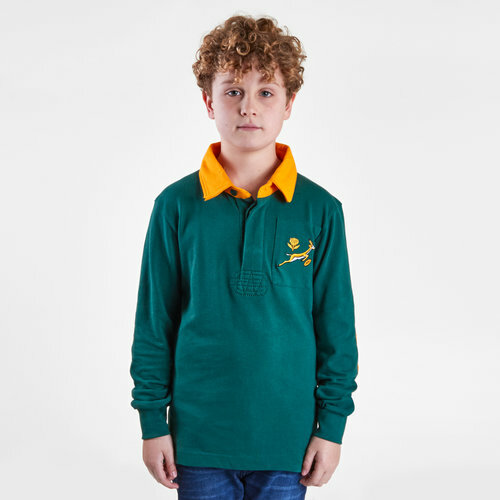 Show your passion and pride for the Springboks with this South Africa 2019/20 Kids Vintage Rugby Shirt from VX-3. The international rugby team the South Africa Springboks was instrumental in the creation of the Rugby World Cup competition, the Springboks did not compete in the first two World Cups in 1987 and 1991 because of anti-apartheid sporting boycotts of South Africa. The team made its World Cup debut in 1995, when the newly democratic South Africa hosted the tournament. The Springboks defeated the All Blacks 15–12 in the final, which is now remembered as one of the greatest moments in South Africa's sporting history. South Africa regained their title as champions 12 years later, when they defeated England 15–6 in the 2007 final. This look needs no introduction as it comes in the traditional green with a yellow collar. 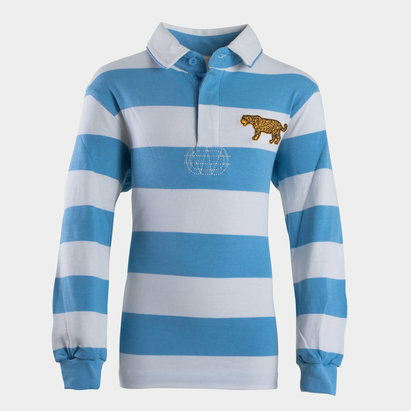 The South African Springbok is stitched aside the buttoned neckline with the words South Africa stitched under the collar. Cheer on Bokke at the 2019 Rugby World Cup with this polo.